The Spanish Grand Prix is one of the oldest and most famous races in the world. This Formula One event will be watched by millions around the world when it is held at the Circuit de Barcelona-Catalunya in 2017. But why are we telling you all this? Because Mr Green is giving away VIP tickets to this iconic contest, as well as gigantic amounts of cash in yet another amazing prize draw. So, start your engines and get set for the Race to the RACE. First prize - Two VIP tickets to the Formula One Gran Premio de Espana on May 14th complete with hotel and flights. Those cash prizes are paid out as real money, which means they come free from any wagering requirements. For your chance to win cash or Grand Prix tickets, spend at least £20 on Mr Green’s exclusive Live Blackjack or Roulette tables between the 1st and 28th of February. Once you’ve spent the initial £20, you will qualify for prize draw entry. However, for a better chance of being named one of the 10 lucky players, keep on playing at those Blackjack and Roulette tables, since every further £20 you spend will give you another entry into the competition. The random prize draw will then be held on March 1st and all winners contacted by email or telephone. The Race to the RACE promotion will be active from the 1st until the 28th of February 2017. Only gameplay made with real money on the Live Roulette and Blackjack tables during this period will count towards the prize draw. 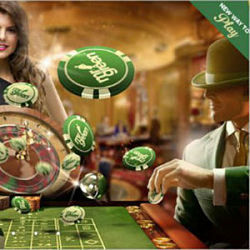 All registered members of Mr Green Casino are welcome to take part in the offer, regardless of how long they have been members of the site or how much money they have wagered in the past. The grand prize winner will be contacted by telephone within 72 hours of the draw being held. The other nine winners will be contacted by email. For this reason, it is important that the site has your correct contact information on file.